Soft’N Stretch™ fabric positions the anatomically-designed Gel pad to cushion and protect. 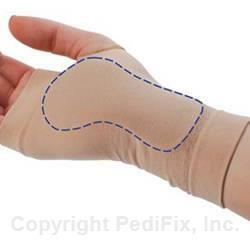 Reduces impact, shock and vibration to ease discomfort following injury, surgery, or burns. Allows a full range of motion and provides mild compression. Low profile design. Helps soften scars. Small fits average sized hands. Large fits bigger hands. 1 per pack. Wash and dry affected area. Slip sleeve on so that gel pad is placed where needed. Remove for at least 3-4 hours a day to allow skin to breathe. If you have diabetes or poor circulation, consult your physician before use. If numbness, discoloration, irritation or additional pain occurs, discontinue use immediately. If symptoms persist, visit a physician.